Anyang GEMCO Energy Machinery Co., Ltd (a division of ABC Machinery) is the main manufacture of briquetting machinery in China. We supply 4-30T/H complete briquetting machinery, roller & screw briquetting press machine, Shisha charcoal briquette press machine and coal ball machine. The 4TPH complete briquetting machinery have been designed to produce briquettes from a variety of granular or powdered material. such as: charcoal, coal, coke, iron oxide, iron concentrate, metal powder, iron powder, dried sewage sludge, steelwork dust, etc. 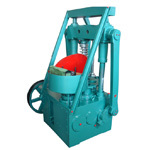 Our roller briquetting press machine are four-roller double-pressing type. 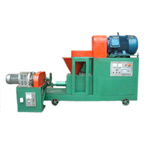 This type of briquetting machinery can apply higher pressures and thus produce higher density briquettes. 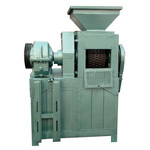 High Pressure Dry Powder Briquetting Machine is widely used to make briquettes from various powdery materials. The main purpose of the machine is to reduce powder pollution, minimize size/capacity of raw material, recycle and make more it convenient for transportation. This screw briquette press machine can be used to extrude charcoal stick of different diameters (diameter range: 15-65mm) in cylinder or square shape without hole in the product through different moulds from charcoal dust or charcoal powder. Our shisha charcoal briquetting press is applicable for making small round tablets from charcoal dust. The output briquettes are in high density, perfect shape, good appearance. Meanwhile, it is easy for combustion, no smell and last longer when burning. 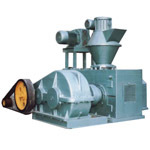 Our coal ball machine can press coal powder, charcoal powder, etc. into various shapes product.